We’d love your help. Let us know what’s wrong with this preview of Governing the Commons by Elinor Ostrom. Neither the state nor the market have been successful in solving common pool resource problems. This study accordingly analyzes communal interests in land, irrigation communities, fisheries, etc. and proposes alternative solutions. To ask other readers questions about Governing the Commons, please sign up. In 1968 (already a crowded and frantic year), an ecologist named Garret Hardin published "The Tragedy of the Commons" in the journal Science. The 'tragedy' comes from when a shared resource is used so many individuals that demand accelerates past supply. Although each individual is aware of the shortage, they will continue to consume out of individual self-interest, to the detriment of the group. Eventually, as the resource is exhausted, leading to shortages, and in the case of food stocks, a Ma In 1968 (already a crowded and frantic year), an ecologist named Garret Hardin published "The Tragedy of the Commons" in the journal Science. The 'tragedy' comes from when a shared resource is used so many individuals that demand accelerates past supply. Although each individual is aware of the shortage, they will continue to consume out of individual self-interest, to the detriment of the group. Eventually, as the resource is exhausted, leading to shortages, and in the case of food stocks, a Malthusian population collapse. This is not a problem of technological advances, but of patterns of human behavior. Sound familiar? Ostrom's work is an extended response to this problem, as well as the difficulties of governing common-pool resources. She addresses the problems of centralized authority in attempting to govern these resources (e.g. corporations or a central government), in that they lack the detailed knowledge of locals, and also lack the monitoring capacity to prevent abuse or the 'free rider' problem. Her work in finding a solution to this problem involves multiple factors, such as a clearer definition of property rights, and developing structures to form collective agreements on the usage of natural resources. It is a response to the individualist ideas of 'rational choice' theory, and asserts that in certain circumstances, collective interest is concentric with self interest. What makes this work stand out is that it is not just a 'neat idea' to be bandied around in a theoretical sense. The majority of the book is dedicated to examples and applications of local solutions to problems, ranging from redistricting police units to village fishing policies. Within these examples a reliable framework for empirical insight but also a moral appeal. Yes, it is possible to prevent overconsumption on a local scale, and foster reasonable economic growth. Small wonder that Ostrom became the first and only woman to win the Nobel for Economics, and that everybody from the American Enterprise Institute to the Green parties of the world celebrated it. The only real 'problem' with her ideas of organization involve the problems of scale. These ideas of organization work for individual economies and regions, but how could they be accomplished on a larger scale? However, she also provides some hints of a framework for organizing larger economies this way, and it is a problem that public choice theorists have been searching over the past twenty years. This work is, for me, a model of great social science work. As someone thinking of going to an economics PhD program in the not-so-distant future, I will definitely benefit from having this book in the back of my mind. The topic of the book is common-pool resources (CPRs)--which economists define as resources that are "rival" (if I take some of it, that reduces the supply available to anyone else) but "non-excludable" (it is difficult to prevent people from making use of it). A classic example o This work is, for me, a model of great social science work. As someone thinking of going to an economics PhD program in the not-so-distant future, I will definitely benefit from having this book in the back of my mind. The topic of the book is common-pool resources (CPRs)--which economists define as resources that are "rival" (if I take some of it, that reduces the supply available to anyone else) but "non-excludable" (it is difficult to prevent people from making use of it). A classic example of this, and one among those studied by Ostrom, is a fishery--there are only so many fish, but with a big enough area, it's pretty difficult to police boundaries or restrictions. The mainstream economics literature, and because of it much popular commentary, has focused on such resources from a set of related perspectives referred to as "the prisoner's dilemma" and "the tragedy of the commons." These models suggest that in some CPR situations, individuals acting in their rational self-interest will end up making decisions that are sub-optimal from a group point of view--generally, overusing the resource. As we can observe with most deep-sea fisheries, this is often indeed the case. But Ostrom's interest lies in those cases where the predictions of these classic models do not come true: situations where a group of people has established a durable voluntary system for regulating use of the CPR, which neither resorts to privatization nor external regulation (the two preferred remedies of the tragedy-of-the-commons crowd). Ostrom's style is extraordinarily appealing to me. Though the book is relatively recent, she writes in what I would call a "classic" style reminiscent of Smith or Keynes. She works systematically and logically, frequently making use of fundamental concepts of economics (for instance, discount rates), but the book is free of equations or mathematical models. I am sure that Ostrom was conversant in mathematical modeling, and used it in her academic papers, but it is a testament to the significance of her ideas that she was able to express them in this way yet have the book retain a strongly academic (that is, not "popular") character. I also really appreciated the perspectives Ostrom took on models and math--something Smith and Keynes didn't have the opportunity to do because of the state of the discipline in their time. She talks persuasively about the model as metaphor. For example, she discusses the way that the prisoner's dilemma has become such a dominant way of thinking about collective challenges, despite the fact that it is highly specialized and requires that the payoffs be just so, because of the captivating counterintuitiveness of the result. She talks quite compellingly about the way economists tend to take the perspective of "the state", and how often economic models assume that individuals will be self-centered and myopic while the technocrats in the government will be wise and far-sighted. This book transformed the way I look at the world. For many societal problems a standard dichotomy is between market-based solutions and government-based solutions. As anyone reading this review knows, much of our politics and public discourse is organized around arguments between these two basic mechanisms for solving problems. This is especially true for management of common-pool resources: things like water, forestry, the climate, fisheries, land, and so on. Some people want to create property This book transformed the way I look at the world. This is especially true for management of common-pool resources: things like water, forestry, the climate, fisheries, land, and so on. Some people want to create property rights in these things, and design an effective market. Other people insist that good government regulation is the key. Early in her career, Ostrom noticed a third approach that has a lot less mindshare. In some cases, common-pool resources can be managed through self-organized governance systems. She begins the book, for example, with a discussion of how fishers from the town of Alanya, in Turkey, have organized to prevent over-fishing. In this book, Ostrom investigates when such self-organized governance systems work, and how they can fail. Instead of adhering to ideology and theory, she takes a close, clear-eyed look at dozens of fascinating examples, and tries to figure out what underlying principles are responsible for success or failure. The result is a nascent theory for high-quality self-governance of common pool resources. Whenever I hear a political debate, underlying the discussion is often an assumption that we need to use markets or government to solve big problems, and that it's just a question of integrating those two ideas appropriately. Ostrom's book skewers that assumption. The good news is, there's hope: the Tragedy of the Commons is not inevitable. Ostrom identifies factors necessary for productive and long-term use of these resources, illuminating real-world case studies and offering hope for those who sincerely want to make things work. It can happen. This isn't a political work: Ostrom sneers at both libertarians (“The private sector will fix it!”) and statists (“the government will fix it!”) while recognizing that the real world requires good doses of both phi The good news is, there's hope: the Tragedy of the Commons is not inevitable. Ostrom identifies factors necessary for productive and long-term use of these resources, illuminating real-world case studies and offering hope for those who sincerely want to make things work. It can happen. This isn't a political work: Ostrom sneers at both libertarians (“The private sector will fix it!”) and statists (“the government will fix it!”) while recognizing that the real world requires good doses of both philosophies. You know, reality. Science. Not what you wish would be; what is. Just after the global financial crisis of 2008 the Nobel Prize in Economics was awarded to Elinor Ostrom for her work on Common Pool Resources (CPR). While I'm not sure if there was a correlation between the two events, it does seem that giving the award to someone who's body of work shows that people can successfully handle pooled resources without government regulation or privatization was at least a happy coincidence. 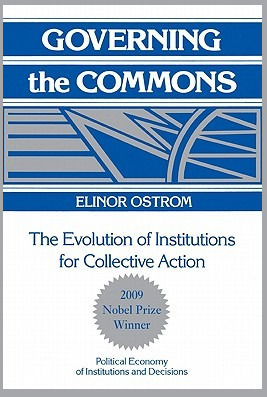 In this book Ostrom details a variety of different situations around the wor Just after the global financial crisis of 2008 the Nobel Prize in Economics was awarded to Elinor Ostrom for her work on Common Pool Resources (CPR). While I'm not sure if there was a correlation between the two events, it does seem that giving the award to someone who's body of work shows that people can successfully handle pooled resources without government regulation or privatization was at least a happy coincidence. In this book Ostrom details a variety of different situations around the world where people have come up with solutions for dealing with CPR. Some situations have been highly successful, others not as much, but all are described in great detail along with analysis on why the situation has been or not been able to work. The overall thesis is to show that the most popular models used in dealing with common resources, mainly the tragedy of the commons, are very pessimistic and are only good for people who have no communication or are very short sighted. The last chapter in particular details explicitly problems with trying to use tractable models in economics and sets out her own parameters for future policy makers to use. Elinor Ostrom's quiet revolution has been an interdisciplinary hit: it has influenced economics, sociology and political science, only to name the most obvious candidates. Her 1990 book, Governing the Commons, is a breathtaking example of a scholar who has refused to bow to false idols. The book combines powerful theoretical perspectives with relevant empirical research. The beginning and the end are more theory-heavy. The vast chunk in the middle is taken up by laboriously detailed case descript Elinor Ostrom's quiet revolution has been an interdisciplinary hit: it has influenced economics, sociology and political science, only to name the most obvious candidates. Her 1990 book, Governing the Commons, is a breathtaking example of a scholar who has refused to bow to false idols. The book combines powerful theoretical perspectives with relevant empirical research. The beginning and the end are more theory-heavy. The vast chunk in the middle is taken up by laboriously detailed case descriptions of various Common Pool Resource (CPR) governance models from around the world. What is striking about the book is how it eschews simple theoretical models, such as those of rational choice theory or of neoclassical welfare economics, while simultaneously taking advantage of some of the key ideas in those fields, e.g. economics, social psychology, game theory, public choice theory, etc... And these ideas are modified, in a Popperian fashion, to suit the empirical reality in the field. Ostrom's synthesis of these theoretical ideas, while important in and of itself in the abstract, is married intimately into her application of them into the empirical field work. The main concern of Ostrom's work is to show how rationally motivated individuals, acting under uncertainty, environmental constraints, imperfect information and heterogeneous interests, are able to solve - more often than they "should" according to mainstream economic theory - the debilitating trifecta of the tragedy of the commons, prisoner's dilemma and collective action problems. Ostrom shows how fishermen, cattle ranchers, water appropriators and other CPR agents are able to come together to achieve collective improvements. In successfully organizing for collective action, individuals and groups are able to engage in institutional rule-making and rule-reforming, often in ways that are context-dependent, built upon the local knowledge of the participants in the cooperative enterprise of their community. From a reader's point of view, the painstaking details of the empirical examples can be overwhelming. And for the casual reader it might make sense to skim through some of the details. But there is nothing superfluous about any of it. On the contrary, every example allows a glimpse into the crucial human variables that underline human cooperation under uncertainty. Ostrom's keen theoretical eye is able to salvage, from the seeming chaos of communal rules from all the corners of the world, some underlying universals of sustainable cooperation between appropriators. The significance of Ostrom's work extends far beyond the narrow confines of the CPR problem. Her work can be used to extend neoclassical economics into areas beyond price signals and beyond the assumptions of perfect competition, zero transaction costs and transparent information. There is no such thing as "the markets" that can solve everything. And, at the same time, by opening up a polycentric and nested perspective on decision making, Ostrom's work can be used to challenge the assumption of a singular, centralized government acting as an exogenous rule-bestowing agent. Ostrom's work continues the legacy of the great thinkers in political philosophy and economics. It is ultimately up to the people, acting within and without markets, to solve their own problems. In many ways, although she doesn't say so herself, her work continues the legacy of anarchism, by showing how rules emerge from agreement, and how consensus can emerge from conflict. Too few books are challenging, exciting and groundbreaking at the same time. And too few thinkers are able to offer major breakthroughs in both empirical and theoretical research. But Ostrom's "Governing the Commons" is one of those rare gems, and it should be mandatory reading for anybody interested in social institutions, conflict resolution and political economy. In generating forums of cooperation, the expansion of institutions of self-governance can create a path forward beyond the stifling dilemma of government lethargy and market fundamentalism. "The tragedy of the commons, the prisoner's dilemma, and the logic of collective action are closely related concepts in the models that have defined the accepted way of viewing many problems that individuals face when attempting to achieve collective benefits. At the heart of each of these models is the free-rider problem. Whenever one person cannot be excluded from the benefits that others provide, each person is motivated not to contribute to the joint effort, but to free-ride on the efforts of others. If all participants choose to free-ride, the collective benefit will not be produced. The temptation to free-ride, however, may dominate the decision process, and thus all will end up where no one wanted to be. Alternatively, some may provide while others free-ride, leading to less than the optimal level of provision of the collective benefit. These models are thus extremely useful for explaining how perfectly rational individuals can produce. under some circumstances, outcomes that arc not 'rational' when viewed from the perspective of all those involved. "What makes these models so interesting and so powerful is that they capture important aspects of many different problems that occur in diverse settings in all parts of the world. What makes these models so dangerous - when they are used metaphorically as the foundation for policy - is that the constraints that are assumed to be fixed for the purpose of analysis are taken on faith as being fixed in empirical settings, unless external authorities change them. The prisoners in the famous dilemma cannot change the constraints imposed on them by the district attorney; they are in Jail. Not all users of natural resources are similarly incapable of changing their constraints. As long as individuals arc viewed as prisoners, policy prescriptions will address this metaphor. I would rather address the question of how to enhance the capabilities of those involved to change the constraining rules of the game to lead to outcomes other than remorseless tragedies." "Relying on metaphors as the foundation for policy advice can lead to results substantially different from those: presumed to be likely. Nationalizing the ownership of forests in Third World countries, for example, has been advocated on the grounds that local villagers cannot manage forests so as to sustain their productivity and their value tn reducing soil erosion. In countries where small villages had owned and regulated their local communal forests for generations, nationalization meant expropriation. In such localities, villagers had earlier exercised considerable restraint over the rate and manner of harvesting forest products. In some of these countries, national agencies issued elaborate regulations concerning the use of forests, but were unable to employ sufficient numbers of foresters to enforce those regulations. The foresters who were employed were paid such low salaries that accepting bribes became a common means of supplementing their Income. The consequence was that nationalization created open-access resources where limited-access common-property resources had previously existed. The disastrous effects of nationalizing formerly communal forests have been well documented for Thailand, Niger, Nepal, and India. Similar problems occurred in regard to inshore fisheries when national agencies presumed that they had exclusive jurisdiction over all coastal waters." Appropriation rules restricting time. place, technology, and/or quantity of resource units are related to local conditions and to provision rules requiring labor. material. and/or money. Appropriators and their officials have rapid access to low·cost local arenas to resolve conflicts among appropriators or between appropriators and officials. The rights of appropriators to devise their own institutions arc not challenged by external governmental authorities. Appropriation. provision. monitoring, enforcement. conflict resolution, and governance activities are organized in multiple layers of nested enterprises." "By monitoring the behavior of others, the appropriator-monitor learns about the level of quasi-voluntary compliance in the CPR. If no one is discovered breaking the rules, the appropriator-monitor learns that others comply and that no one is being taken for a sucker. It is then safe for the appropriator-monitor to continue to follow a strategy of quasi-voluntary compliance. If the appropriator-monitor discovers a rule infraction, it is possible to learn about the particular circumstances surrounding the infraction, to participate in deciding the appropriate level of sanctioning, and then to decide whether or not to continue compliance. If an appropriator-monitor finds an offender who normally follows the rules but in one instance happens to face a severe problem, the experience confirms what everyone already knows: There will always be instances in which those who are basically committed to following the set of rules may succumb to strong temptations to break them. "The appropriator-monitor may want to impose only a modest sanction in this circumstance. A small penalty may be sufficient to remind the infractor of the importance of compliance. The appropriator-monitor might be in a similar situation in the future and would want some understanding at that time. Everyone will hear about the incident, and the violator's reputation for reliability will depend on complying with the rules in the future. If the appropriator-monitor presumes that the violator will follow the rules most of the time in the future, the appropriator-monitor can safely continue a strategy of compliance. The incident will also confirm for the appropriator-monitor the importance of monitoring even when most others basically are following the rules. "A real threat to the continuance of quasi-voluntary compliance can occur, however, if an appropriator-monitor discovers individuals who break the rules repeatedly. If this occurs, one can expect the appropriator-monitor to escalate the imposed sanctions in an effort to halt future rule breaking by such offenders and any others who might start to follow suit. In any case, the appropriator-monitor has up-to-date information about compliance and sanctioning behavior on which to base future decisions about personal compliance." "Let us take another look at the larger CPRs (within the universe of cases considered) and how those that have succeeded in solving problems of collective action have done so. All of these are characterized by design principle 8: the use of nested enterprises. The larger organizational units in these systems are built on previously organized smaller units. In the Spanish huertas, the fundamental organizational unit is the tertiary canal. The cost of organizing a group of farmers living near to one another and appropriating directly from the same canal is considerably less than the cost of organizing a large group of farmers many of whom never come into direct contact with one another. But once the smaller units are organized, the marginal cost of building on that organizational base is substantially less than the cost of starting with no prior base. Several of the Spanish huertas are three or four layers deep . . .
"Success in starting small-scale initial institutions enables a group of individuals to build on the social capital thus created to solve larger problems with larger and more complex institutional arrangements. Current theories of collective action do not stress the process of accretion of institutional capital. Thus, one problem in using them as foundations for policy analysis is that they do not focus on the incremental self-transformations that frequently are involved in the process of supplying institutions. Learning is an incremental, self-transforming process." "One can search the development literature long and hard, for example, without finding much discussion of the importance of court systems in helping individuals to organize themselves for development. The first time that I mentioned to a group of AID officials the importance of having an effective court system as an intervention strategy to achieve development, there was stunned silence in the room. One official noted that in two decades of development work she had never heard of such a recommendation being made." "Subsidizing the purchase of new technologies has been a frequent strategy of national governments in relationship to fisheries, with results that have at times been disastrous. The effort to finance the acquisition of a new technology presumes that local fishers will not adopt efficient new technologies without external aid. The conservatism of fishers in regard to the use of new technologies may reflect an awareness that the management of complex resource systems depends on a delicate balance between the technologies in use and the entry and authority rules used to control access and use. If the adaptation of new technologies is accelerated, the relationship between the rules and technologies in use may become seriously unbalanced. This is particularly the case when the rules have come about through long processes of trial and error and fishers do not possess legal powers to devise new rules and get them enforced. A focus on "production costs" alone, rather than on the total of production costs, transaction costs, and enforcement costs, leads to a narrow interpretation of efficiency (Nonh 1986a,b). The rapid introduction of a "more efficient" technology by an outside authority can trigger the very "tragedy of the commons" that the same public officials presume will occur if they do not regulate the use of these fisheries. See Cordell and McKean (1986) for a discussion of the effects of the subsidization of a new technology on the Rahian coast of Brazil by national authorities." Elinor Ostrom won the Nobel for her work on common-pool resources, so this book represents Economics orthodoxy on the topic. From there she goes on to explain how a common-pool resource differs from a public good li Elinor Ostrom won the Nobel for her work on common-pool resources, so this book represents Economics orthodoxy on the topic. 8. For larger common-pool resources there is a need for multiple layers of nested enterprises to take care of “provision,” “appropriation,” “monitoring,” “enforcement,” “resolution,” “government” etc. It’s a formidable list, but it’s not exhaustive. In the spirit of Douglass North and Mancur Olson, the author next introduces a further factor in the equation, and that’s the contribution that government institutions have to make to common-pool resources by means of providing technological expertise and a helpful legal framework that will jointly act to support, help shape and enforce the decisions of the agents who engage in the provision and appropriation of the common-pool resource. The example here comes from a very thorough examination of how institutional change was made possible in the case of a number of rather diverse groundwater basins in California in the 1950’s and 60’s. A long list of failures comes under the microscope next: two Turkish fisheries, yet another Californian groundwater basin, a (totally fascinating) Sri Lankan fishery (p.151), followed by a couple borderline cases in Sri Lanka and Canada. They are all checked against the list, with a summary (p.180) of successes and failures that makes for some very persuasive reading. I’ll be totally honest, I read this entire book with an eye toward analysing the European common currency as a common-pool resource, but in the end I was captivated by the theory itself. Even if I never apply this knowledge to anything, I thoroughly enjoyed reading “Governing the Commons.” I was entertained and challenged in equal measure. In 1968, an ecologist and philosopher named Garrett Hardin wrote an essay, called "Tragedy of the Commons". It was enormously influential in a different field, economics, because it seemed to explain how individuals who all are attempting to maximize their own individual welfare can end up with a result no one wanted. He postulated a common grazing area, that anyone could graze their cows on. If each herder thought that others would overgraze the common pasture, it would make sense for them to o In 1968, an ecologist and philosopher named Garrett Hardin wrote an essay, called "Tragedy of the Commons". It was enormously influential in a different field, economics, because it seemed to explain how individuals who all are attempting to maximize their own individual welfare can end up with a result no one wanted. He postulated a common grazing area, that anyone could graze their cows on. If each herder thought that others would overgraze the common pasture, it would make sense for them to overgraze it first, with their cattle. This would mean the pasture would have no food for them later, but since the pasture would be doomed regardless, each herder would want to graze their own cows there soon, before the pasture was overgrazed and no longer available to them. The "Tragedy of the Commons" became a catch-phrase to explain why owning things in common was doomed to failure. Elinor Ostrom was an economist who did what was, for an economist, a remarkable and unusual thing. She went out to check the real-world data, to see if that's what really happened. Do people who hold a finite but renewable resource in common, get a tragic outcome? It turns out, sometimes they do, and sometimes they do not. Then, Ostrom did something else unusual for an economist. Instead of retreating to her office to theorize about a mental model for why it would turn out sometimes one way and sometimes another, she started amassing as much real-world data as she could, from both failed and successful commons. Fisheries, irrigation systems, groundwater basins, as well as grazing areas, in several different continents and in areas as wealthy as Switzerland and Japan, or as poor as Sri Lanka and the Phillipines. It turns out that there are some things which long-term, successful use of common resources have in common, which make them different from ones which for one reason or another fail to succeed. These reasons don't fall predictably along left-wing or right-wing ideals. Ostrom distills them down to 8 rules, but I won't list them here, because each of the rules needs a good bit of explanation to make sense. Even better than Ostrom's explanations, are her case studies, both those she did herself and those which she has collected from colleagues. Some of the commons she examines have been in continuous use for centuries (in one case probably over 1,000 years) without being tragically overused and degraded. Probably even more surprising to me was the case studies from the area around Los Angeles in the 20th century, related to groundwater. Who knew that Americans could find a way to arrive at consensus? Ok, we only got to 80%, and the courts had to seal the deal to force the other 20% to not keep pumping water out from under their neighbours beyond what could be replenished, but still. Reading about Americans solving political issues through negotiation and consensus, with an eye to long-term consequences, was astonishing. In the same chapter, though, we read a case study of another water basin not far away, where the parties involved failed to reach an effective agreement. So, it is not just a cultural issue, or Americans (more precisely, southern Californians) would either be capable of managing common resources, or not. In fact, though, while culture has a role to play, there are other factors at work as well. How big is the group trying to manage the resource? How well are they able to exclude others who are not parties to the agreement? Do they have the ability to modify the rules themselves, or are these handed down by a remote governmental agency? And so on. "A resource arrangement that works in practice can work in theory." This is clearly a high quality piece of narrowly focused academic literature. As such, it doesn't necessarily lend itself to be read by a lay audience. My rating represents how much I would recommend it those interested in the title on its general merits. Certain sections which were more conversational and focused on the game theoretic aspects of coordination problems stuck with me the most. Other chapters which got into the fine detail of case studies of water management and fisheries managemen This is clearly a high quality piece of narrowly focused academic literature. As such, it doesn't necessarily lend itself to be read by a lay audience. My rating represents how much I would recommend it those interested in the title on its general merits. Certain sections which were more conversational and focused on the game theoretic aspects of coordination problems stuck with me the most. Other chapters which got into the fine detail of case studies of water management and fisheries management were harder to get through. Communities can and do design institutions to govern the commons despite collective action challenges. Success stories are due to successful institutional design specifically tailored to the communities/resources that the institutions serve. 2 - Developing successful governance is really hard, takes a long time, and is often best accomplished outside the purview of the state. 3 - Eight principles for successul institutional design: (1) clearly defined boundaries (2) adapted to local conditions (3) inclusive decisionmaking (4) effective/accountable monitors (5) conflict management institutions (6) graduated sanctions for enforcement (7) nested in larger systems (8) Recognition / acceptance of resource ownership by external authorities (the state). The writing style of the author is amazing, simple and clear. You don't need to have a background about the subject to read the book. The author discussed new and historical cases about the commons in a great details. Common-pool resources (CPRs) are the focus of this book. CPRs have multiple users (or appropriators of the resources). The underlying theme is creating an alternative way to of organization the use of the CPRs. Rather than the state or market (entrepreneur/firm) deciding on the fate of the resources, this book shows that local communities can organize themselves to prevent unsustainable extraction of the CPRs. Rather than an external organizing force, an internal network shaping people’s behavio Common-pool resources (CPRs) are the focus of this book. CPRs have multiple users (or appropriators of the resources). The underlying theme is creating an alternative way to of organization the use of the CPRs. Rather than the state or market (entrepreneur/firm) deciding on the fate of the resources, this book shows that local communities can organize themselves to prevent unsustainable extraction of the CPRs. Rather than an external organizing force, an internal network shaping people’s behavior. As Ostrom shows, many communities have historically created institutions which facilitated sustainable extraction of resources, making the resource available for future generations. The resources under observation are renewable such as geographical basins and fisheries. As these resources are limited, conflict and free-riding are ubiquitous incentives. The communities had to overcome these and many problems. Rather than evading these problems, Ostrom emphasizes how the communities designed institutions which helped resolve the problems. Infractions to the institutions can be handled informally rather than using formal means of punishing community members. As the communities under observation are local, there is an incentive to monitoring others behavior as the infractions hurt each individual. Those who break the rules tend to be handled quickly, and as everyone in the community will shortly be aware of the rule breaker. This information motivates the rule breaker not to continue with the infractions to prevent dishonor, while providing proof that the monitoring works. Social norms are highly effective at altering behavior. Enforcement of the rules need to be credible and change as the rules change. Although the author claims that these communities did not have external authorities in dictating the terms, it seems to be contradictory with the examples, for the communities themselves created the external monitor of rules, internalized the external monitor. Each community needs predetermined rules to set the appropriate expectations, with each community varying in determining what rules there are and how to enforce them. Some communities have different rules based on the condition of the CPR. Many rules require loads of information, and the community needs to take risks to obtain the appropriate information to handle their particular CPR. Epistemology is present in this book for Ostrom takes much time to express the need for both theory and empirical work. Many parts of this book express the formulation of how policies are designed and their evolution. Great detail went into the examples of the communities that succeeded and failed but the examples are not the most exciting, although they are extremely important. The complex situations described makes some parts more easily understood than others. Throughout the book, game theory is used, but to understand the depth of the implications requires a good deal of prior knowledge of game theory. A lot of the implications can easily be missed with no prior game theory knowledge. Very dense, I haven't had this hard of a time reading a book in a while. In common resources, such as underwater basins and forests and pastures and fisheries, there's a strong incentive to take more than the resource can support. If you take too much water out of a basin water levels will drop and it will eventually become incapable of holding as much water as it previously did. Once the population of a fishery collapses it's not coming back for a while. Ideally you'd all agree to limit the amoun Very dense, I haven't had this hard of a time reading a book in a while. Ideally you'd all agree to limit the amount of water you draw. However, there's a free-rider problem, everybody will always continue to have the incentive to overdraw and benefit from the resource that everybody else is preserving. Even coming to that agreement is difficult, you have to decide upon the rules you'll follow and get buy in from everybody. That's work that you'd much rather have someone else do for you... there's a second-order incentive to free-ride! She looks down upon the traditional solutions to this problem. Letting "the government" manage and distribute the resource ignores the substantial costs in gathering information to determine the correct rules and in monitoring to enforce those rules. The external monitors are then subject to principal-agent problems (such as bribery). And governments have a strong desire to defray those costs by imposing uniform rules across their jurisdiction, an impulse which ignores the often substantial differences between different fisheries. Another "traditional solution" is that of property rights, just carve the pasture into chunks and give each chunk to a farmer. This ignores that larger shared pastures are more useful and give more consistent results. It's not even possible to carve a fishery or a water basin into chunks. You could give the entire water basin to someone, but even if they rent the water out to others they'll centralize the profits of management. And the implicit assumption that private property owners have low discount rates (and will therefore preserve the resource) is often wrong. She shows examples of common resources which are managed without private property or government intervention. The individuals involved have crafted rules which are specific to their local situations. They monitor each other with minimal costs, and have cheap and quick methods of punishing each other and resolving conflicts. They all share both the low costs and the large benefits management. There are some communal forests and pastures in Japan and Switzerland which have been managed without over-foresting or over-grazing for millennia. A seminal work which is altogether pleasant to read. Mandatory reading for anyone involved in common goods management and thinking (including water, environment, cultural commons with copyright or copyleft, online communities). Ostrom shows that there are many different ways to manage common goods (or specifically common pool resources, CPR) and various kinds of local, decentralised or custom-based governance systems have proved successful. The dychotomy between privatization and state control is A seminal work which is altogether pleasant to read. Mandatory reading for anyone involved in common goods management and thinking (including water, environment, cultural commons with copyright or copyleft, online communities). Reminder for scholars to be more specific when working with models of the commons. Appreciate the emphasis on individual (and institutional) agency in extricating ourselves from various environmental/commons dilemmas. Would have liked some engagement with Indigenous models -- these offer some intriguing alternatives to the case studies she analyzed. Extremely interesting and thought provoking, it will challenge your perceptions of how and why people work together when they are faced with a common resource. This is a work I'll probably have to revisit if the topic becomes more relevant to my own research. It's interesting and well-constructed, but at times repetitive. Great, but not my fav econ work. She has a lot of valuable insights, but I felt she got bogged down in details. That may say more about me than her, though. I thought this book was going to be kind of dry, but I actually really enjoyed reading all of the case studies. Even the more theoretical chapters were interesting and fairly easy to read. Strong research that produced clear guidelines for effectively governing commons. Exceptional and important work! In this book, Elinor Ostrom examines the dismal "tragedy of the commons" argument that is so widely accepted and frequently used to advocate for private ownership as a mechanism to "protect" common pool resources (and other types of resources). For this purpose, she presents real life case studies of both successful and failed attempts to utilize common pool resources by multiple actors, and showing how they do not fit the simple theoretical models of the "rational" actor with perfect information In this book, Elinor Ostrom examines the dismal "tragedy of the commons" argument that is so widely accepted and frequently used to advocate for private ownership as a mechanism to "protect" common pool resources (and other types of resources). For this purpose, she presents real life case studies of both successful and failed attempts to utilize common pool resources by multiple actors, and showing how they do not fit the simple theoretical models of the "rational" actor with perfect information that leads inevitably to the tragedy of the commons. She then attempts to define a theoretical framework for models to analyze CPRs more accurately, taking into account the complexities of reality and a more nuanced characterization of human behaviour. All in all it felt to me like Elinor Ostrom was awarded the Nobel prize in Economics because she reminded economists that humans aren't simply greedy, omniscient, homogeneous monsters who will blindly maximize their own benefit at any cost to others or the environment, but rather varied beings with a spectrum of intentions, and with the capacity to think ahead, act strategically, and even sometimes cooperate to solve their common problems. Ostrom is one of the greatest social scientists of the 20th century, her Nobel price supports this statement. This book is very educational, scientific and on the point. There are pages and pages of just different numbers about a certain society. She is obsessed with numbers. You can find stats for every single thing these societies produce and how they produce them. Amazing. These pages of nothing but numbers (well, numbers and points about them) could be imagi Read this book before you die. Ostrom is one of the greatest social scientists of the 20th century, her Nobel price supports this statement. This book is very educational, scientific and on the point. There are pages and pages of just different numbers about a certain society. She is obsessed with numbers. You can find stats for every single thing these societies produce and how they produce them. Amazing. These pages of nothing but numbers (well, numbers and points about them) could be imagined to be the most boring things ever by someone like me - but somehow I liked it. It was like meditating. And the fact that she actually took the time to do real science and not just write about a society makes this book a must read. Anthropology at its finest. El manejo de recursos de uso común que tienen una definición poco clara en sus derechos de propiedad es la temática central del libro de Ostrom. En este trabajo analiza distintos modelos de acción colectiva y pone en duda las conclusiones tradicionales sobre el manejo de dichos recursos, sea la privatización o el control por parte del Estado. Para Ostrom existen otros mecanismos en las comunidades que permiten que estas se auto gestionen sin necesitar de la supervisión y regulación absoluta del El manejo de recursos de uso común que tienen una definición poco clara en sus derechos de propiedad es la temática central del libro de Ostrom. En este trabajo analiza distintos modelos de acción colectiva y pone en duda las conclusiones tradicionales sobre el manejo de dichos recursos, sea la privatización o el control por parte del Estado. Para Ostrom existen otros mecanismos en las comunidades que permiten que estas se auto gestionen sin necesitar de la supervisión y regulación absoluta del estado y sin renunciar a la propiedad comunal privatizandola. Elinor Ostrom won the 2009 Nobel Prize in Economics.